Our history books depict the German people as mostly going along with the Third Reich, offering little pushback to the rise of the Nazi Party. But a group of students at the University of Munich, the so-called White Rose Society, offered resistance in the form of an anonymous leaflet and graffiti campaign. As you might assume, they were eventually crushed by Hitler’s forces, but these brave students were a symbol of heroism to the nation, however briefly. 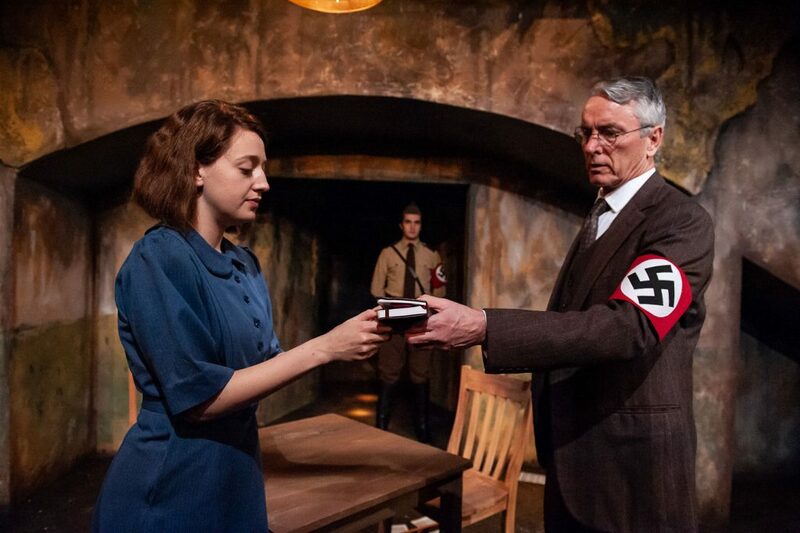 David Meyers’ play We Will Not Be Silent dramatizes the true story of one such crusading protester, Sophie Scholl, seen in a series of interrogations aimed at breaking her spirit and revealing the names of her compatriots. And in the process, it asks the audience to consider what it would do in her situation. Much of the FAU Theatre Lab production’s 80 minutes are a verbal tug-of-war between Scholl and a fictional Gestapo functionary named Kurt Grunwald. Alternately good cop and bad cop, he deprives her of sleep, food and water for days, then suddenly professes to be her advocate, while threatening the inevitability of a swift trial and execution. Sophie’s dilemma is relatively straightforward. She merely has to confess – to sign some words on a piece of paper – in exchange for her life, albeit a life in prison. The character of Grunwald is more interesting, for he is a stand-in for the Germans who justified to themselves being accomplices of Hitler, however distasteful they found that role. During the interrogation, Grunwald finds that he has many views in common with Sophie, but he values too highly the comforts and safety afforded by allegiance to the Nazis. Again, the play tacitly asks, what would you do in his shoes? Michael McKenzie, a veteran of Broadway and several South Florida theaters, gives an impressively nuanced performance as Grunwald, convincingly making the many transitions from browbeater to placater and back again. Isabella Werber is his capable scene partner, who grows increasingly disoriented from the forced deprivations, yet playwright Meyers has her converse articulately throughout. The actress is an empathy magnet, which keeps the play from its tendency to being a dry account of history. Sophie and Grunwald are 90 percent of the play, but there are occasional appearances of Sophie’s brother Hans (Zak Westfall), a White Rose co-founder, and a nameless guard (Alec Kalled) whose chief duty is slamming shut the massive door to the interrogation chamber. Louis Tyrrell, the recent artistic director of FAU Theatre Lab, stages We Will Not Be Silent with an invisible hand, trusting the power of the words and the situation, allowing the interrogation sequences to be rather static. It is fitting that this Southeastern premiere occurs on a university campus. For while the events described in the play are likely to already be known by the company’s generally older audience, much of it may be eye-opening to student attendees. WE WILL NOT BE SILENT, Florida Atlantic University Theatre Lab, Parliament Hall, FAU campus, 777 Glades Road, Boca Raton. Through Sunday, Feb. 24. $35. Call 561- 297-6124 or visit fauevents.com.